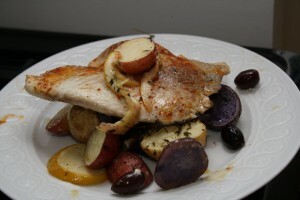 Here is a great roasted chicken recipe — perfect for the fall weather! 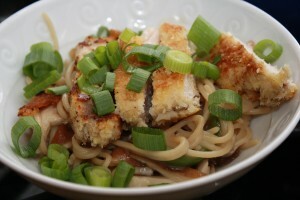 The dish takes about an hour to cook but has minimal prep work so it is definitely doable on a weeknight. I made two minor additions to the recipe. In addition to seasoning the chicken with salt and pepper, I also sprinkled it with some Italian seasoning for a little extra flavor. I also added a couple of tablespoons of capers for the final five minutes of roasting. I love the combo of cauliflower and capers. The chicken was perfectly cooked — nice and juicy — and the veggies were delicious. Although next time, I’ll use smaller florets — not all of the cauliflower was as tender as I would have liked. Place a rimmed baking sheet in oven and preheat to 450 degrees, with racks in upper and middle thirds. Season chicken with salt and pepper. Carefully remove sheet from oven and arrange chicken, skin side up, in a single layer. Roast on upper rack, 20 minutes. 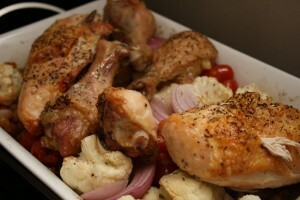 Remove chicken from oven and, with tongs, transfer to another rimmed baking sheet along with tomatoes. Add cauliflower, onion, and chickpeas to drippings on first sheet and toss to combine; season with salt and pepper. Roast chicken on upper rack and vegetables on middle rack until chicken is golden and cooked through and cauliflower is tender when pierced with a knife, about 30 minutes. Transfer chicken and vegetables to a serving dish and serve immediately. Note: Roasting the chicken on a preheated pan saves time and helps the meat brown. You don’t need to add oil to the vegetables; they cook in the drippings from the chicken. The day after Christmas is my father-in-law’s birthday. Tim’s immediately family came up to the Berkshires on the 26th to celebrate. We had the delicious and festive menu below. 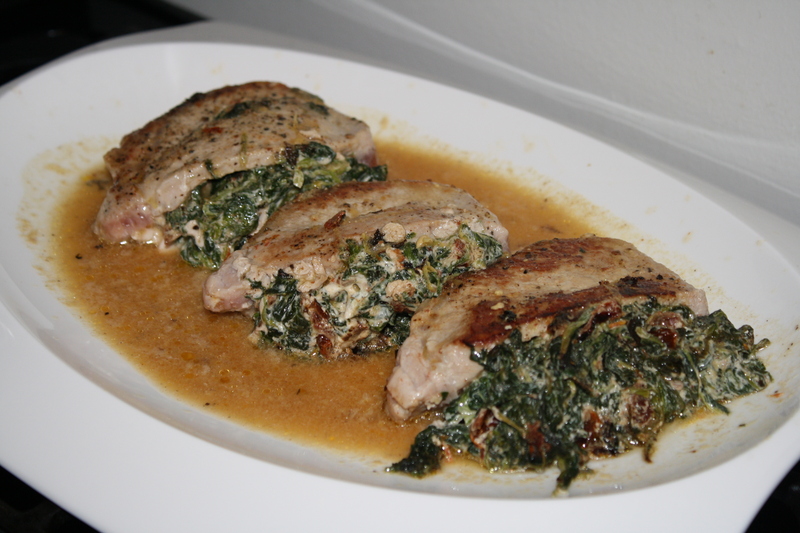 The pork I have made before and it was even better than I remember! The bacon and the honey mustard coating gives amazing flavor to the meat. This is the first time I made the Barefoot Contessa’s Cauliflower Gratin and it was a huge hit! Who wouldn’t love cauliflower with a nice cream sauce and lots of Gruyere. I had some leftover Brussels Sprouts & Butternut Squash. The dish reheated nicely. We finished the birthday meal with a delectable Red Velvet Cake. So moist! And the cream cheese frosting was amazing! If you love black bean soup, you’ll enjoy this slow cooker recipe! How amazing are slow cookers! I love throwing the ingredients in the cooker and then coming home 10 hours later with dinner prepared. This recipe was especially appealing because, as you know, I love any recipe that gets some heat and smokiness from chipotle peppers in adobo sauce. Enjoy! Combine 6 cups water, beans, pork chops, bacon, onion, garlic, chilies, adobo, cumin and salt in slow cooker. Cook on low until beans are tender and pork chops are falling apart, 4 to 6 hours. Remove and discard bacon. Cut pork away from bones. Discard bones and shred meat. 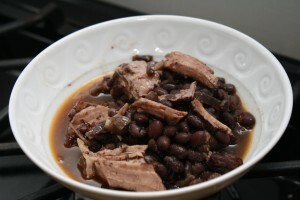 Add meat back to slow cooker with beans. Season with additional salt and serve. Since I am still on a quest for the perfect bolognese sauce, I decided this recipe from the March Bon Appetit was a good use for the last of the ground beef from the steer. This recipe is from a “back country” menu, so it calls for antelope sausage and venison. I didn’t have easy access to either so I substituted spicy Italian sausage for the antelope sausage and ground veal for the venison. The only other changes I made were to halve the recipe and to use a bit more tomato paste than the directions called for. I bought fresh fettuccine — the store didn’t have fresh pappardelle — to serve with the sauce and I prepared a simple green salad as a side. The hearty sauce was delicious and rustic! 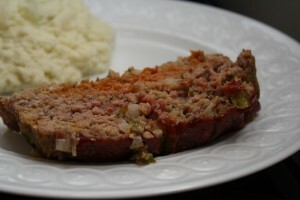 The four different meats — beef, sausage, bacon, and veal — provided wonderful flavor. And, there is plenty left over for another meal this week. I bet the sauce will taste even better when we have it later this week. 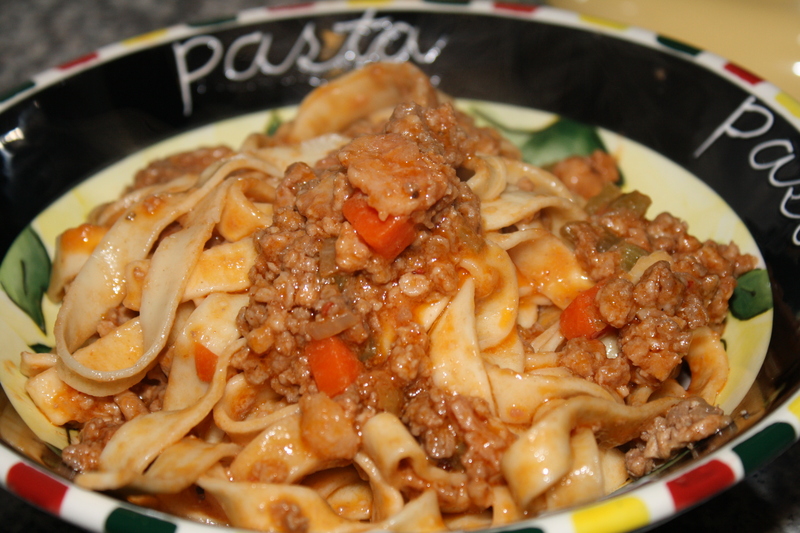 This just might become my go-to bolognese recipe. Melt butter with oil in heavy large pot over medium heat. Add next 4 ingredients. Sauté until vegetables are soft but not brown, 12 to 14 minutes. Add beef, sausage, venison, and bacon. Increase heat to high. Cook until meat is brown, breaking into small pieces with back of spoon, about 15 minutes. Stir in milk, wine, and tomato paste. Reduce heat to low. 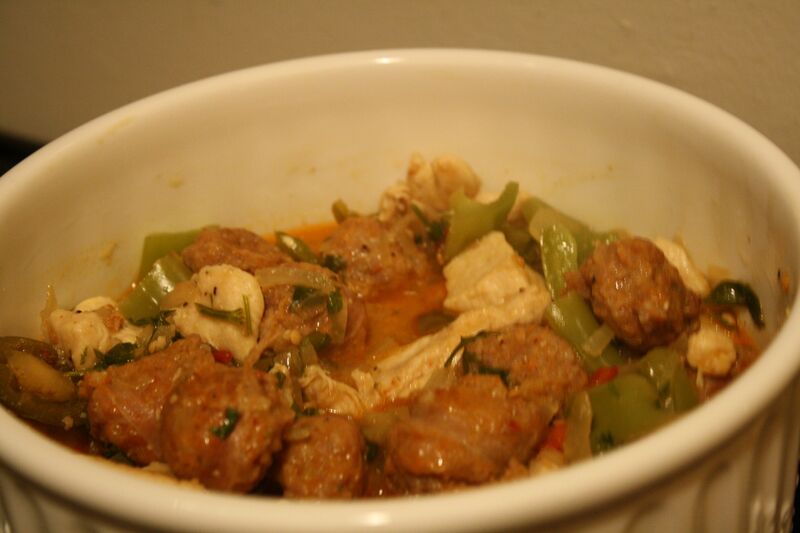 Simmer until sauce is thick, flavors blend, and juices are reduced, stirring occasionally, about 1 hour 15 minutes. Season with salt and pepper. DO AHEAD: Can be made 2 days ahead. Cool 1 hour. Chill uncovered until cold, then cover and chill. Rewarm over low heat. 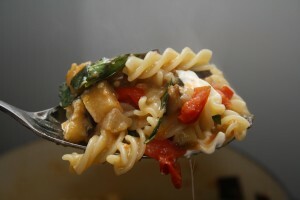 Cook pasta in very large pot of boiling salted water until just tender but still firm to bite, stirring often, 4 to 5 minutes if cooking immediately or 5 to 6 minutes if previously chilled. Drain, reserving 1 cup cooking liquid. Return pasta to same pot. Add warm Bolognese and 1 cup cheese. Toss over medium heat until heated through, adding reserved cooking liquid by 1/4 cupfuls if dry. Season with salt and pepper. Transfer pasta to large shallow bowl. Serve, passing additional cheese. Here is a very tasty way to prepare your basic pork chop! The goat cheese, cream cheese, spinach, and sun-dried tomato filling is super tasty and tangy. The dish looks like it would take a long time to make but comes together quite quickly. A couple of notes…I used sun-dried tomatoes packed in oil that I drained. My box of spinach wasn’t quite thawed so I placed it in a colander, ran hot water over it, and then squeezed it dry. 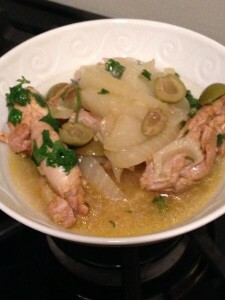 The chicken broth – lemon – mustard sauce adds a very nice touch to the dish. We even dipped some bread in it! Warm the 1 tablespoon olive oil in a medium saute pan over medium heat. Add the garlic and cook until fragrant, about 1 minute. Add the sun-dried tomatoes, spinach, salt, pepper, and thyme. Cook until combined, about 2 more minutes. Transfer the mixture to a medium bowl. Add the goat cheese and the cream cheese. Stir to combine and set aside. Warm the remaining 1 tablespoon olive oil in a large, heavy skillet over medium-high heat. When the pan is hot add the pork. Cook until golden and cooked through, about 4 minutes per side. Transfer the pork to a side dish and tent with foil to keep warm. Add the chicken broth mixture to the skillet over medium-high heat. Scrape up the brown bits from the bottom of the pan as the chicken broth simmers. Reduce the broth by half to make a light sauce, about 8 minutes. 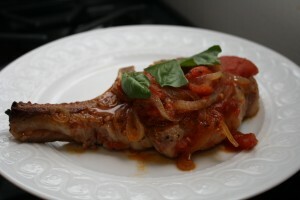 Spoon some sauce over the pork before serving.